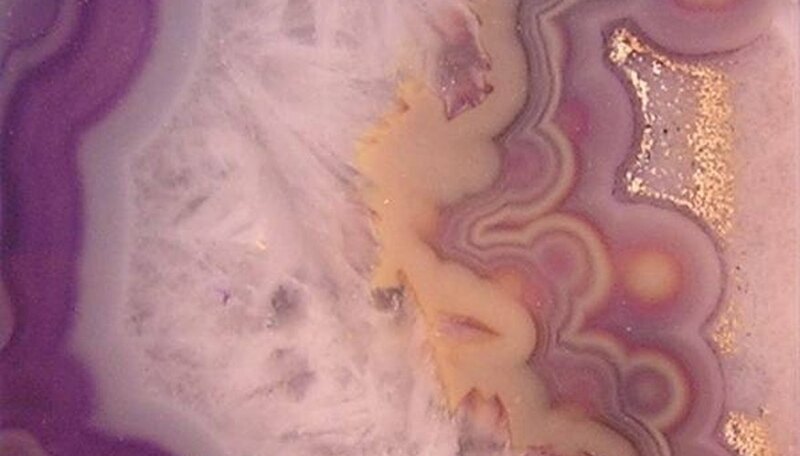 A geode may look like a plain, ugly rock from the outside, but when it is broken open, it is filled with crystals that can be any number of colors. Geodes are formed when water gets into a rock through fine cracks. As the water evaporates, the minerals left behind form the crystals. Geodes can be used several different ways. The most common use for geodes is for decoration. Place it on a shelf for everyone to see or use it to accent your outdoor rock garden. Some geodes you can find in stores are quite large and stand on their own on your floor. Choose a geode that is the right size for your display area and is the right color to match your decor. Small geodes can be made into jewelry. Some stores sell geode jewelry, but if you are lucky enough to find geodes of the right size and shape, you can make your own. For instance, if you can find a very small geode, less than 1/4 inch, that is not very heavy and can break it fairly evenly, you can make your own pair of earrings. Or if you find a small geode that is less than an inch wide, create a necklace using the geode as a pendant. Geodes can serve a double purpose of being decorative and serving a practical use as well. For instance, any geode can be used as a paperweight to hold down the papers on your desk. Use a matching pair of geodes as bookends to keep the books on your shelf from falling over. Some companies have even made some of the largest geodes into small tables by securing a piece of glass over the top of the geode to create a usable surface that still allows the crystals to show through. According to Allegheny Candles, various gemstones have metaphysical properties that help you in your life. Placing a geode in your home that matches one of these gemstones improves your home atmosphere according to these principles. For instance, amethysts are supposed to reflect love, protection and divination. Citrine, another stone that can be found in geodes, reflects money and purifies negative energy into positive energy. Choose the geode gemstone for your home that reflects the attributes you wish to improve. Cave of the Mounds National Natural Landmark: What in the World is a Geode? Turtenwald, Kimberly. "Uses of Geodes." Sciencing, https://sciencing.com/uses-geodes-8111055.html. 24 April 2017.